Virgin coconut oil is made from fresh coconut meat called non-copra, the oil is extracted from fresh coconuts without any chemicals or high heating. Regular coconut oil is made from copra, which is the dried kernel, or dried meat, of the coconut and is usually extracted from the copra with the use of chemical solvents. Virgin coconut oil is a medium chain fatty acid (MCFA). It is nature's richest source of lauric acid. Lauric acid is a rare medium-chain fatty acid found in mother's milk that. protects the infant from infections and other diseases by providing a strong immune system. Lauric acid has been to shown in recent studies to have anti-fungal, anti-viral, and anti-bacterial health-protecting properties. Many researchers predict that lauric acid will soon be as well known in health circles as Omega-3 is today. See my MEDIUM CHAIN TRIGLYCERIDES newsletter. Having antimicrobial properties that help kill harmful fungi and bacteria in the gut. Promoting weight loss. Virgin coconut oil is a medium-chain triacylglycerol oil. Medium-chain triacylglycerol oils go directly to the liver and are instantly converted into usable energy, speeding up metabolism in the body by burning calories. The stimulation in the liver also prompts it to generate more of the enzyme that breaks down fat, called bile. Useful in treating skin conditions such as eczema and dermatitis as well as dandruff and dryness of the scalp. You can use it to moisturize your skin and hair and as a nourishing agent for your scalp. Make a paste by adding 4 tbsp. of virgin coconut oil to a quart jar of warm water, melting it before you apply it onto your scalp. Shake the jar well to mix the oil and the water, and apply to hair. Let it dry without rinsing. Wash your hair at least 24 hours later to give the oil a chance to be absorbed by your scalp. 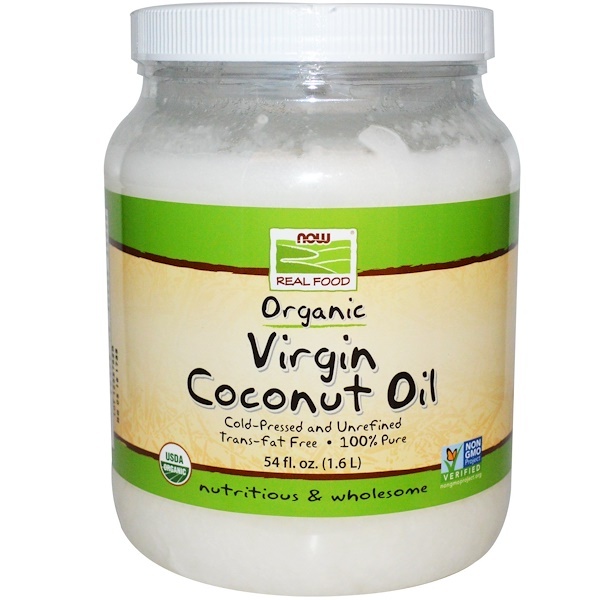 Virgin coconut oil can be enjoyed both raw and for cooking. As with all plant based fats, it is naturally cholesterol free. It is an excellent source of healthy fats, phytonutrients, as well as some vitamins and minerals. (See here for more information on the health benefits of coconut oil.) As with all coconut oil, it is solid and white at room temperature, and melts at 76 F.
Other Ingredients: Organic virgin coconut oil.